J.B.S. Haldane was son of the noted physiologist John Scott Haldane, he began studying science as assistant to his father at the age of eight and later received formal education in the classics at Eton College and at New College, Oxford (M.A., 1914). After World War I he served as a fellow of New College and then taught at the University of Cambridge (1922–32), the University of California, Berkeley (1932), and the University of London (1933–57). In the 1930s Haldane became a Marxist. He joined the British Communist Party and assumed editorship of the party’s London paper, the Daily Worker. Later, he became disillusioned with the official party line and with the rise of the controversial Soviet biologist Trofim D. Lysenko. In 1957 Haldane moved to India, where he took citizenship and headed the government Genetics and Biometry Laboratory in Orissa. Haldane, R.A. Fisher, and Sewall Wright, in separate mathematical arguments based on analyses of mutation rates, population size, patterns of reproduction, and other factors, related Darwinian evolutionary theory and Gregor Mendel’s concepts of heredity. Haldane also contributed to the theory of enzyme action and to studies in human physiology. He possessed a combination of analytic powers, literary abilities, a wide range of knowledge, and a force of personality that produced numerous discoveries in several scientific fields and proved stimulating to an entire generation of research workers. Haldane’s major works include Daedalus (1924), Animal Biology (with British evolutionist Julian Huxley, 1927), The Inequality of Man (1932), The Causes of Evolution (1932), The Marxist Philosophy and the Sciences (1938), Science Advances (1947), and The Biochemistry of Genetics (1954). Selected Genetic Papers of J.B.S. Haldane, ed. by Krishna R. Dronamraju, was published in 1990. In the view of Haldane, The scientific point of view must come out of the laboratory and be applied to the events of daily life. What has already revolutionized industry, agriculture, war and medicine must be applied to the family, nation and the human race. He says that science affects us in two ways – we are benefited by its application for example, using cars, buses and motor vehicles instead of using horse drawn vehicles and for disease we are going to Doctor instead of going for superstitious things (Witch, Tallish-man). The second one is it influences our opinions, as now everyone believes that the earth is round and the heavens are nearly empty instead of solid. Haldane says that the scientist is superior to God as he is ethically neutral, he works out of the consequences of many actions Haldane says that science attempts to be truthful and impartial. By comparing scientific point of view with legal point of view, he says that a judge may only be impartial in giving his judgment between two individuals, whereas a scientist is impartial not only between people but also about a tape worm and the solar system. 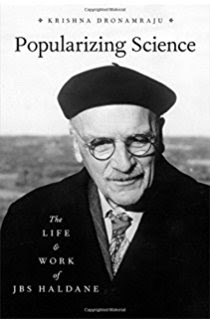 By comparing scientific point of view with God’s view, Haldane says that scientist simply interprets the consequences many actions rather than passing judgments, which is while done by God. The tendency of average man, as Haldane opines, always dwell on the emotional and ethical side of an issue rather than on facts. For this first he mentioned the problem of American Negros. Some Americans believe that Negros are inferior to them and so should be segregated from them. While some believe that they should enjoy the same rights like white Americans. But the scientist makes it clear that both these groups of people are comfortable only in their respective areas and both of them die of consumption whenever they step into each other’s areas. Haldane remarks that our approach to the problem of disease is even less rational. He says that the pre-Christians believe that if someone was suffering from any disease, it was a punishment from some goddess for a sin either by the sick person or his family or of his whole community. But Haldane makes it clear that civilized and savage (uncivilized) man, health and sickness are equally parts of nature. Haldane says that modern medicine has come out with miraculous drugs but it has become very hard to apply its results in practice. With the example of diabetics Haldane remarks that diabetes can easily be controlled by injecting insulin, but they hardly takes the suggestions of doctors regarding to take medicine. By taking typhoid disease as an example, Haldane remarks that the common people always attempt to ‘cure’ from their disease. But Haldane says that a scientist attempts to ‘prevent’ the disease instead of cure it. Finally Haldane says that average man and woman should not be guided by false principles. He concludes that unless and until humans adopt scientific point of view, the enemies of science can’t be conquered. Haldane quotes St. Pauls words that the world is ruled by demons. Haldane modifies that statement and says that the world is misruled by ignoranceand unscientific thinking.